You tee up the golf ball, you serve the tennis ball and, the Mayor Foster's favorite, you pitch the baseball. Well, that's what happened Thursday at the Budget Finance and Tax Committee meeting. A while back the budget shortfall was $10 million, then $12 million, then $18 million and before the meeting was over a whopping $22 million was mentioned. Where did all that come from? Reduced property taxes, falling sales tax revenue on and on. Costs are up, pensions are up - the perfect storm. You have probably had this experience. You go into a store looking for the advertised item, the sales person immediately walks you the most expensive model, and before you know it you buy something in the middle. They call that trading up, by trading down. Or if you prefer, bait and switch. You did not buy the advertised model, you spent a few dollars more. Foster is teeing up, serving or pitching, pick your metaphor, the high end number to set up City Council for a property tax increase. Go for the big number and work backwards. Faced with these staggering numbers and no other place to go is it time to look at the millage rate? Why the problem, as it seems things are getting better? In local government, revenue flow usually trails the economy by 18 to 24 months. What that means is, when things get worse, it takes government that long to feel it so they keep spending, and when things get better it takes and equal amount of time for local government revenue flow to catch up so they are in crisis mode longer. It's mostly due to the way tax levels are set and actual taxes are collected. Smarter people than me predict that 2013 will be down year for local government revenue, 2014 will be slightly down to flat, and in 2015 revenue flow should begin to slowly grow. While the public may not like it, a revenue neutral millage rate increase for St. Pete might not be a bad idea, if it includes a sunset clause. That would mean the tax rate (millage) would go up, but you would pay no more St. Pete property tax that paid last year, and the millage increase would go away in a specific time period say two years. But before we even go there, the City needs to look at the survey results from The Peoples Budget Review, and take another hard look at the top end organizational structure, administrators, directors and assistant directors and managers giving carefully consideration to options like moving the Police Department Communications Center responsibilities to the County. There are still a lot of opportunities to fine tune City operations to save significant amounts of money while delivering quality public service and public safety. City Council should not be overwhelmed by the numbers, they should get the facts, listen to the public input and make sound decisions. Most all don't buy the bait and switch or in this case entice and tax. 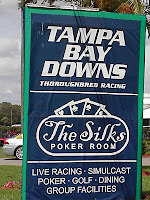 Theresa had a business meeting at Tampa Bay Downs Saturday so we headed for Oldsmar about 10:00AM for a day enjoying the "Sport of Kings" at Tampa Bay Downs (TBD) TBD opened in 1926, it was called Tampa Downs when it first opened. 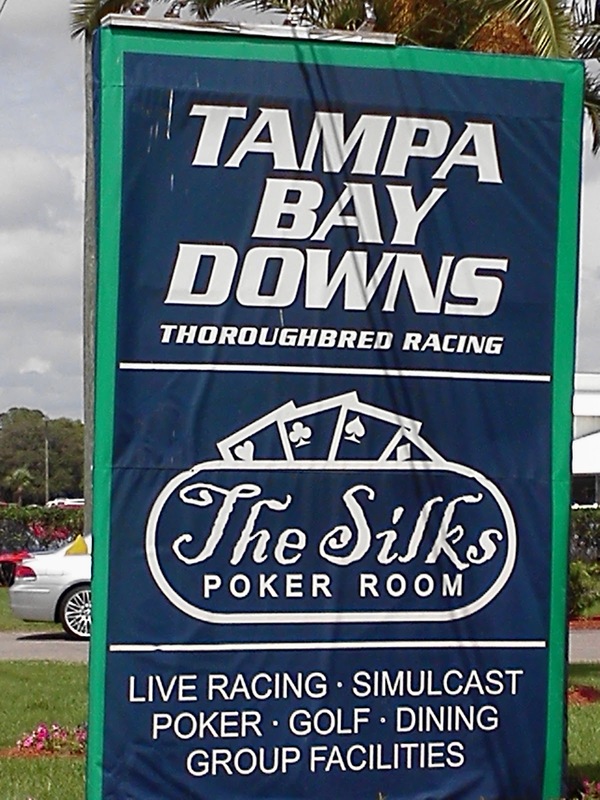 For more information on the track's fascinating history click Tampa Bay Downs. The track is beautifully manicured 1 mile oval with all of the horse racing amenities on site. TBD is a pari-mutuel facility, simply meaning betting and gambling are on site. The meeting was in one of several party rooms available for rent. It had a great view of the track, pretty good food and there was a wagering agent in the room so if you desired to bet you did not have to go to a wagering window to bet or cash out. Horse racing is an easy going event, first race about 12:30PM then 8 to 10 more races about 20 minutes apart. All of the pageantry you see on TV with the stakes races is present and you can get right up to track side and the winners circle. Lots of horsepower, but really quiet. On Saturday 108 different horses were scheduled to run with 35 different Jockeys. The staff was helpful, pleasant and knowledgeable. They also have a racing Program that gives the first time race goers great insight into the sport. The track is about 40 minutes from downtown St. Pete in Oldsmar, on Racetrack Road, phone 813-855-4401, the racing program runs through May. If you are looking for something different to do, check out the TBD web site, and go take a look at the "Sport of Kings" at the only thoroughbred track on the West Coast of Florida. With the departure of interim School Superintendent John Stewart, the Pinellas Country School Board begins, for the fourth time in the last 8 years, a search for a new person to lead the Pinellas County school system. Here is a group that is almost the poster child for dysfunctional decision making. Especially in the hiring arena. Already they are arguing about who the consultant/recruiter should be. Up for sole consideration FASB ( Florida School Boards Association). Just the name sends shivers up my spine. More in breeding. This is the crowd that conducted a national search, recommended Alberto Carvalho from Miami Dade, who turned the job down. Probably after one interview with the School Board. They ended up hiring Julie Janssen. If after looking statewide, and considering only one recommended candidate; then selecting an in house, under qualified, lack luster manager is the best the Board could do, why would they even think about considering FASB. Maybe the Board just likes to deal with its own kind. The problem with the School Board is no vision and no courage. It is time to get a first rate national recruiting firm that can bring candidates who want and appreciate the challenge a school system like ours presents. Let's not let the School Board set up another recruitment "failure" and then quickly hire some insider that we have to pay off to get rid of in a couple of years. Chairwoman Robin Wikle and newest member Glenton Gilzean want to open up the recruiter selection process to completion and that is a great idea. It would be refreshing to follow the rules for a change. County 911 Dispatch for St. Petersburg Police - Why Not? At the last Budget, Finance and Taxation Committee meeting, Mayor Foster held up a City organization chart and said "this is $199 million organization model, we need a $185 million model." County administrator Bob LaSala and Sheriff Bob Gualtieri have begun serious talks to consolidate the County emergency center and the Sheriff's 911 center. The St. Petersburg 911 Center literally duplicates the service performed by the County 911 Center. All 911 calls in Pinellas County go to the County 911 Center. St. Petersburg medical emergency and fire calls are already dispatched by the County Center. Calls for St. Petersburg Police Service (911) are answered by the County 911 Center and transferred to the St. Pete Center, where they are processed through a call taker and a dispatcher, adding two more people and additional time to the actual Police dispatch. Centralized dispatch should result in better service for the public. Duplicating 911 call centers has always been a parochial issue, and the City can no longer afford it. There is absolutely no reason to spend millions of dollars on a dispatch center in the new Police building to duplicate something that already exists at the County level ; and continuing to spend millions of operational dollars on Police dispatch when the balance of that money can be turned into on the street police presence. The cost of the new Police Building is driven as much by the technology as it is by the bricks and mortar. Elimination of a fully functional 911 center and its associated security, environmental requirements and technology infrastructure should reduce the cost of the new Police building significantly. Now is the time to get the Public safety issue on the Budget radar. The Mayor and City Council must take the lead in developing a new, more efficient and more effective public safety program. It is time for that annual City government exercise called the Budget. In St. Petersburg this year the budget cycle is going to be a bit different. In the last election one of the Charter amendments requires the Mayor to bring a balanced budget to the City Council. In the past, the administration would bring a budget that was NOT balanced to City Council putting Council in the position of making the painful cuts. It was kind of fun forcing the elected folks to squirm with the painful stuff of budget reductions. This approach was one of former Council Member Herb Polson's biggest frustrations. He sponsored the Balanced Budget Charter amendment this year, which passed. The administration must bring a balanced budget to City Council, and Council needs to force the Mayor to do just that. No laundry lists, no alternatives - a balanced budget. The first rough projection (the shock and awe number) is a $10 million shortfall on a $199 million operating budget. That is just about 5%. That $10 million figure is before some significant costs are in, such as healthcare insurance increases, pension increases, utility and other fixed costs that may increase. The shortfall will likely drop with home sales increasing and sales tax revenue up a bit. The final number should be in 5 to 7 million dollar range. But if any of the unknown costs shoot up, they could soak up the likely revenue increases. With the departure of new Budget Director Matt Spoor, former Safety Harbor City Manager who left just about as quickly as he was hired, it is unclear who is really running the budget process. City Administrators, Directors and Managers are a well seasoned group. There are still some here who worked on the Dome. They are, for the most part, very good at what they do. They know how to put together a budget and they know how to build "flexibility" in to those line items. Whoever manages the Budget process is in for a real challenge as the administration tries to tuck money in and around the normal budget for the Pier, the new Police Building, support for the Rays. A new person here, a few bucks there so we can do this or that study, few more dollars for marketing, some extra money in Down Town Development all in the budget but off the record and not part of the $50 million cap for the Pier. All of this while trying to cut up to 10 Million from the 2012 budget. Should be intresting.